Como puedo poner estanteria flotante? o diseñar una biblioteca? Looking forward to you reply !!! now I want to bring in the feature like floor planner. 1) how do I dictate how many actual steps a staircase has? For example a friend’s house little steps between split levels in the house. I need to show the wiring of a room with regards to the light switches and I cannot figure that out. How to change to be your partner accuount ? 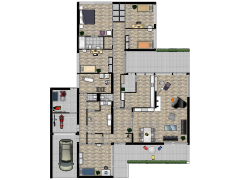 I know only Partner accounts can use the API of floorplanner. My qustion is how much it costs . Now I want to use your API to create a application in our own web site in China…. How can I put wood floors? 1. walls snap together and cannot be split and adjusted to different heights. 2. the create a wall function does not allow a wall to be adjusted vertically. COMO VISUALIZAR EM 3D UM ANDAR EM CIMA DO OUTRO ? I’m trying to find the best method for creating temporary accordion walls within a meeting space. Heeeel vaak verdwijnen er gewoon objecten of complete plannen etc etc etc . Echt kloten. I have just gone to a plus account. i want to copy the existing design and change the name so i don’t have to start from scratch or have them called copy. Como faço para colorir as paredes da edificação? Can I send with my friends with them still being able to edit? Anyone know why the floor stopped expanding or contracting when I moved walls? Is there a way to get it back? I have tried closing out my browser, using an alternate browser. No luck. Is there a way to change the colors of the walls? Deze objecten kan ik plaatsen in 2D, maar in 3D verschijnen ze niet op de muren. Hi, I am trying to insert a curtain, and it works in 2D, but when I try to visualize in 3D it doesn’t appear. What can I do, please ?